Best grown in moist, fertile, humusy, well-drained soils in part shade. Site in locations protected from strong winds to protect the foliage. Aralias often self-sow where the berries drop and are somewhat easy to naturalize into colonies. Aralia cordata, commonly known as Japanese spikenard, mountain asparagus or udo, is a thornless, rhizomatous, herbaceous perennial that typically grows somewhat rapidly to 3-6’ tall and as wide in a single season. It is native to shady parts of forested areas and grassy slopes in Japan, Korea and east-central to southern China. Compound leaves (to 3’ long) are 2-3 pinnate with 3-7 coarse, finely toothed, cordate-based, ovate leaflets (each to 6” long) per pinna. Inflorescence consists of white flowers in umbels arranged in large terminal and axillary spike-like panicles (to 1 1/2’ long). Flowers bloom from late summer to early fall (late July –September). Young shoots of this plant are considered a culinary delicacy in Japan (taste resembling that of asparagus) where they are cultivated in underground tunnels. White fleshy roots (elongate cylindric rhizomes) are eaten as one would consume a parsnip. Udo leaves may be eaten as a vegetable when young. Genus name comes from the Latinization of the old French-Canadian name of aralie. Specific epithet from Latin means heart-shaped in reference to the plant leaflets. ‘Sun King’ is a golden-leaved cultivar that features a large rounded clump of golden yellow compound leaves which is topped in summer by 2’ tall spikes of tiny white flowers. Deep reddish-purple to purplish-black inedible berries ripen in fall. Birds love the berries. 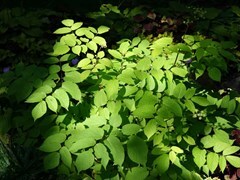 Foliage retains good yellow color throughout summer unless grown in too much shade. This cultivar was introduced into the U.S. by Barry Yinger who reportedly found it in a department store nursery in Japan. No serious insect or disease problems. Watch for aphids, mealybugs, spider mites, slugs and snails. Leaf spot may appear. Excellent for shaded areas of the landscape. Rear of shaded borders.